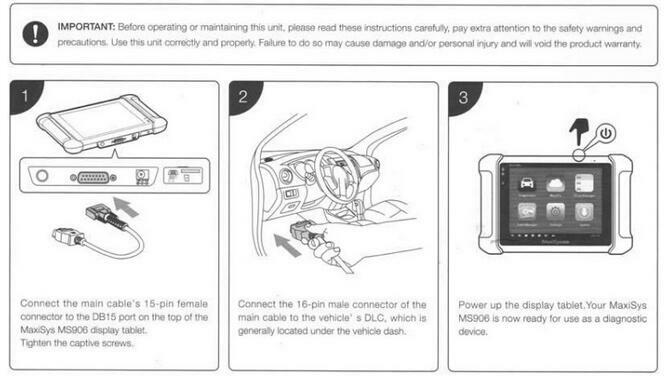 This is the the guide to help you connect Autel MaxiSYS MS906 with the vehicle via the OBD cable. 1- connect the main cable’s 15pin female connector to the BD15 port on the top of the MaxiSys MS906 display tablet. 2- Connect the 16pin male connector of the main cable to the vehicle’s DTC, which is genrally located under the vehicle dash. 3- power up the display tablet. your MasiSys MS906 is now ready for use as a diagnostic device.